The krewe’s original parade route was designed specifically to serve people who were unable to attend other parades in the city. The route passed in front of 14 institutions that cared for people with disabilities and illnesses. 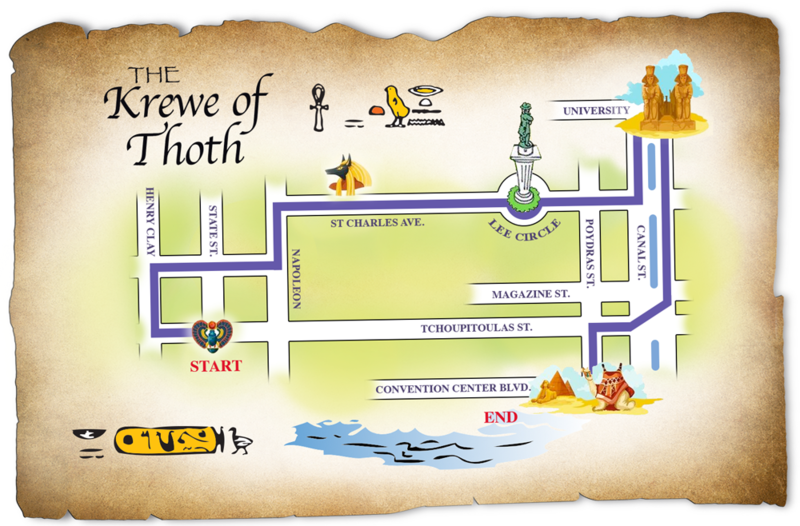 Now with over 1600 riders and 50 floats, Thoth continues with a unique route designed to pass in front of several extended healthcare facilities. The parade will head northwestward to Henry Clay Avenue, where the krewe will turn northeast. At Magazine Street, the krewe will east and follow Magazine until Napoleon Avenue, where the parade will turn north. The Krewe of Thoth will follow Napoleon north until St. Charles Street, where the parade will turn east. At Canal, the parade turn northwest. At the intersection of University Place and Canal Street, the krewe will turn around and head southeast. At the interesection of Canal and Tchoupitoulas Street, the parade will turn south on Tchoupitoulas.